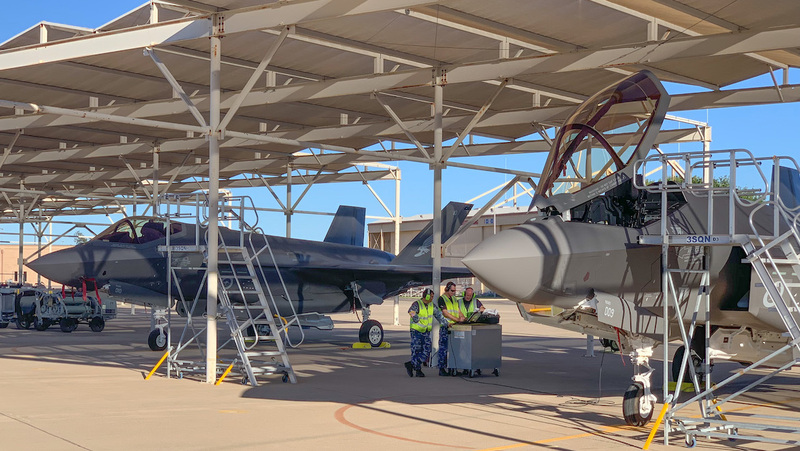 This story from Andrew McLaughlin about the Royal Australia Air Force’s F-35 activities at Luke Air Force Base in Arizona first appeared in the January/February 2019 edition of Australian Aviation. The Arizona desert is usually dry, but on this July day storm clouds sat on the surrounding mountains and I was gasping for breath as the humidity of the two month-long “monsoon” took hold of the day and squeezed the oxygen out of it. This when my rental car’s temp gauge was already reading 118 degrees, or 48C. “Who the hell would want to build an air force base – let alone America’s fifth largest city – in such an inhospitable and debilitating environment?” I wondered as I drove from the airport along the elevated freeway above the treeless concrete jungle to my hotel. 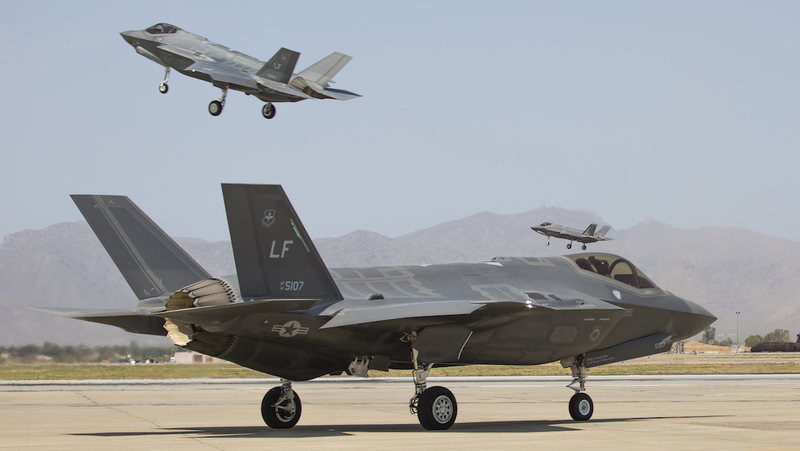 Luke Air Force Base is located on the western fringes of Phoenix and is a hive of activity as F-35 production ramps up, US, Joint Strike Fighter (JSF) partner nations and Foreign Military Sales (FMS) customer units move in, and facilities are upgraded. 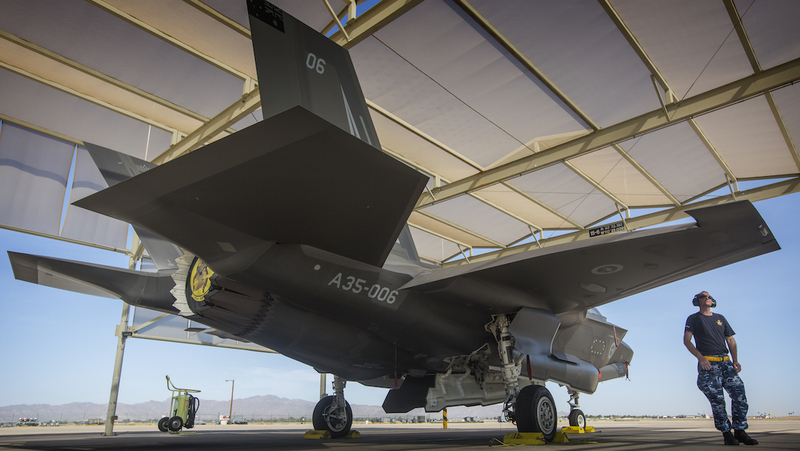 The RAAF currently has a detachment of eight F-35As and around 40 personnel based at Luke AFB including about a dozen pilots, some of whom are embedded with the USAF’s 61st Fighter Squadron (FS) at the multi-national Pilot Training Center (PTC). 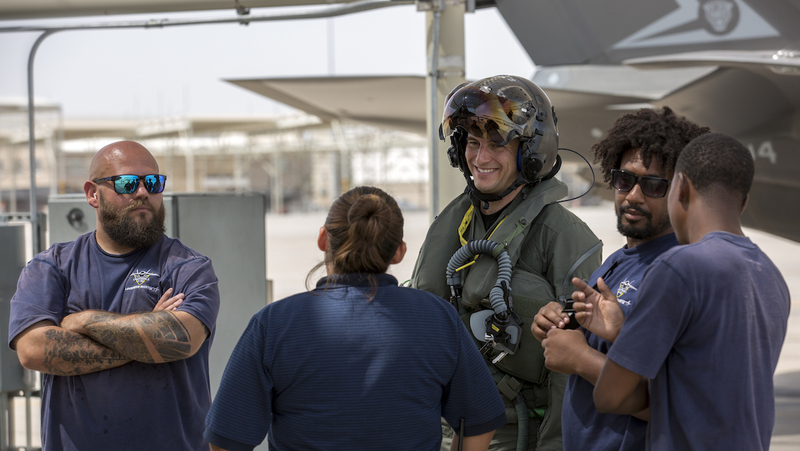 RAAF pilots and maintainers learn to fly and maintain the F-35 at the PTC and the 61st FS, and they then instruct other trainees on it. The RAAF’s PTC detachment is led by WGCDR Jordon ‘Junior’ Sander who will take over as the CO of 2OCU at Williamtown when that unit exchanges its F/A-18A/B Hornets for F-35As in Australia in 2020. 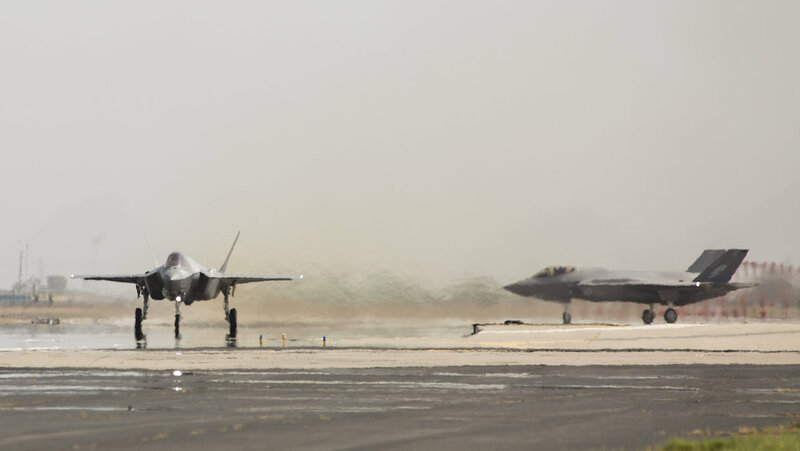 The 3SQN detachment was spun off from the larger 61st FS as a stand-alone entity in mid-September after the unit successfully passed a key airworthiness board milestone in August, authorising it to operate the F-35A under Australia’s own maintenance and airworthiness systems. Before this, RAAF F-35 flying at Luke was conducted under a Chief of Air Force directive that allowed them to operate within the US construct. It meant all maintenance was overseen by Lockheed Martin in accordance with US procedures. “What the airworthiness board has now allowed is for maintenance to be done under Australian rules and procedures which our guys had been writing for over a year,” CO 3SQN WGCDR Darren Clare said. 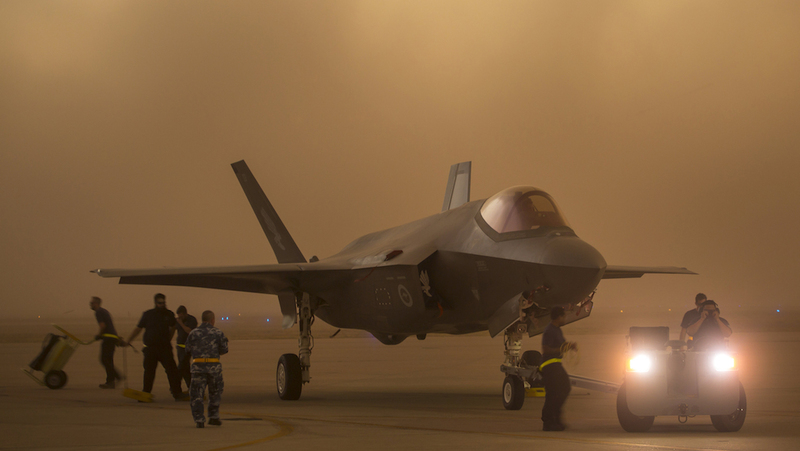 Following the airworthiness board, 3SQN took delivery of the RAAF’s 9th and 10th F-35As from Lockheed Martin in late August and early September, and they were placed straight onto the RAAF’s airworthiness system, before being ferried to Australia in December. 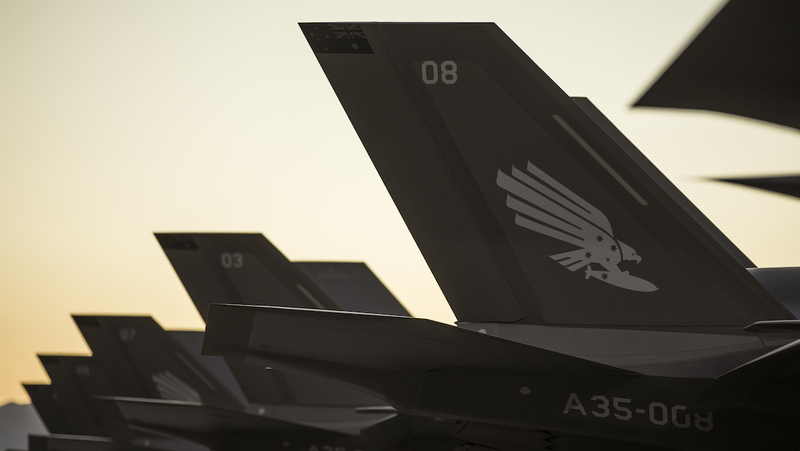 The other eight jets will stay on the 61st FS’s flightline under the US system until they are transferred to RAAF operational units after 2019. The Australian system differs from those of the US in that most of the RAAF’s maintenance staff are trained in multiple trades on the aircraft. The USAF tends to have more people who specialise in specific trades and rarely deviate from them. Another key difference is the USAF model where the crew chief stands near the nose of the aircraft during start-up while technicians run around and under it conducting various checks. 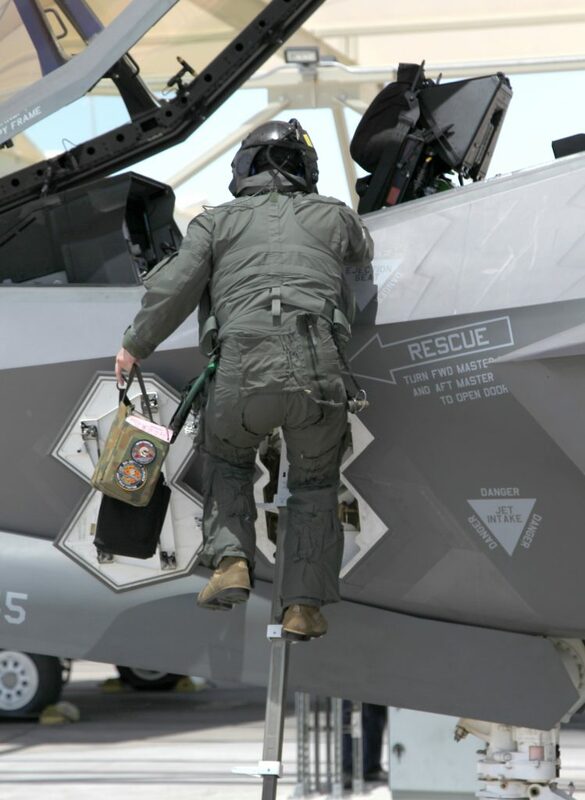 In that scenario, the F-35 pilot has to request permission from the crew chief to move the control surfaces and run up the engine in case a crew member is underneath the aircraft. While the RAAF also assigns ground personnel to stand near and control the area immediately around the aircraft, the pilot has to give permission for crew members to move around under the aircraft. 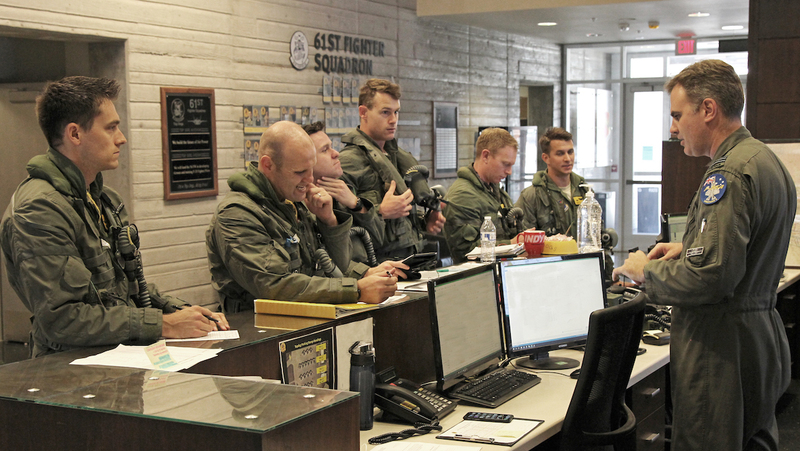 Since the first members of the RAAF cadre arrived at Luke AFB in 2014, they’ve built a close relationship with their USAF 61st FS hosts and the Lockheed Martin contract support team. “In 1918, Number 3 Squadron of the Australian Army Flying Corps was operating out of western France when it flew its ‘Harry Tate’ RE8 aircraft, and successfully dropped ammunition supplies at low level to both Australian and American forces in the Battle of Hamel,” Australia’s Air Attaché to the US, AIRCDRE Terry Van Haren said at a November 9 event hosted by the Australian element to recognise the relationship. “It’s a friendship that’s formed under difficult circumstances,” WGCDR Clare said at the event. “We’re there for each other in the good times and bad. Australia has been fighting alongside the US in every major conflict since World War 1. It’s an ongoing and enduring friendship, whereby we rely on each other for support in those times of need. “In the spirit of the ‘100 Years of Mateship’ campaign, we wanted to say thank you for the support so far to get us to this point,” he added. “It’s not the end. Australia will have a presence here in the 61st FS for a number of years to come, but we appreciate all that you’ve done to get us where we are today. During Australian Aviation’s July visit to Luke, the commander of the 61st FS, LtCol Rhett Heirlmeier told us that the relationship between the two services has been far from one-sided. “It’s awesome, it’s a great relationship with the Australians,” he said. “They’ve been here from the very beginning as the squadron stood up, and they have joined right in to our air force and the 61st FS organisation and picked up roles just like a US Air Force pilot would have done. And they’ve battled through all the challenges we’ve had as we’ve tried to stand something up. “It’s not just turn the key and it runs. You have to put a lot of effort and energy into it,” he added. “And they’ve been through all of those challenges with us. In a lot of ways Australians have shown tenacity in identifying challenges that we might not have been aware of. “There’s been goodness in seeing things from different perspectives as you blend our two air forces together. “Obviously everybody does their thing a certain way, but I think there’s a real strength in seeing some differences. I’ve noticed a lot of exchange of ideas in both directions in the way that we teach the students, the way we run operations, and the way we discuss things. LtCol Heirlmeier has an impressive resume, having previously flown the Boeing F-15C before moving to the Lockheed Martin F-22 as an operational and then instructor pilot. He has led the 61st FS for nearly 18 months. “I think I was lucky to have an F-15 experience, from a legacy platform perspective where you really had to work sensors to get information then fuse it up here,” he said as he tapped his head. “To then go into the F-22 and be like, ‘Oh this is great, sensors do all the work for you’ – they fuse the picture and now you’re really just a decision-maker. So coming into the F-35, that was the same. The Pilot Training Center at Luke is the model for the RAAF’s Integrated Training Centre (ITC) being established at Williamtown in time for when 2OCU stands up its F-35 capability there in 2019. 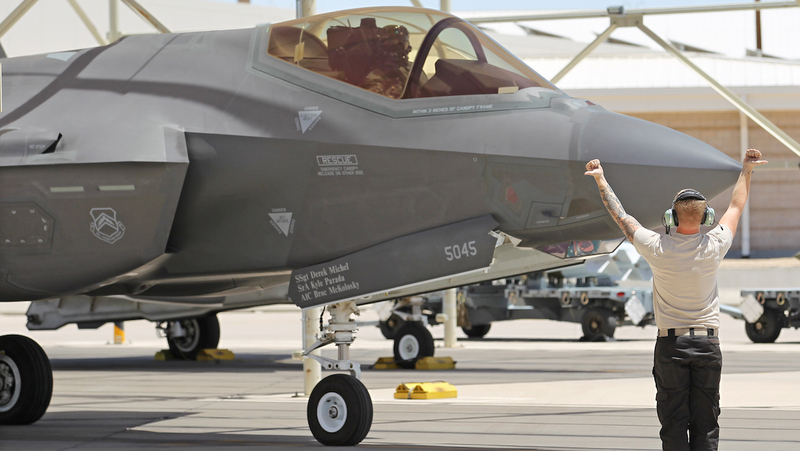 After arriving at Luke in May, WGCDR Sander had his first flight in the F-35 in August. “I have been flying since I was 16, have over 2,000 hours in the Hornet over the last 17 years, and have instructed on many FCI courses,” he said. “Despite all this, there is nothing like a new aircraft type to make you feel like you have never flown before. It is the years of muscle-memory that you are fighting or trying to retrain. When you get in a stressful situation your brain defaults to its long-term memory, so for me that is the classic Hornet. 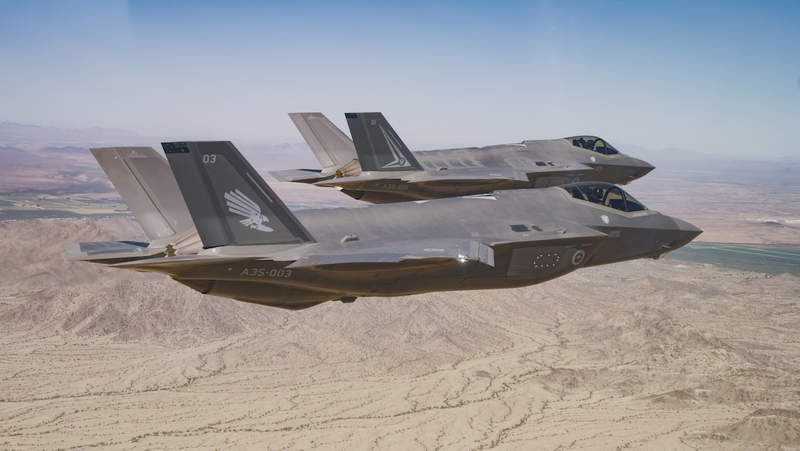 “Because there are no two-seat F-35s, the first flight you have in the jet will be a solo. Therefore, it’s vital that the synthetic training devices and courseware is of sufficiently high fidelity to give a pilot the confidence when they first step into the cockpit. The simulator part of the course covers general flying, formation flying and air-to-air refuelling. But a large proportion of the sim time is spent doing emergency procedures such as flameout and precautionary flameout (FO/PFO) landings. “The flameout training was a new thing for someone like me who had flown a twin-engined fighter their entire life,” WGCDR Sander said. “When I reflect on my sims, the following stands out – the autopilot is excellent, and I use it much more than on the Hornet. 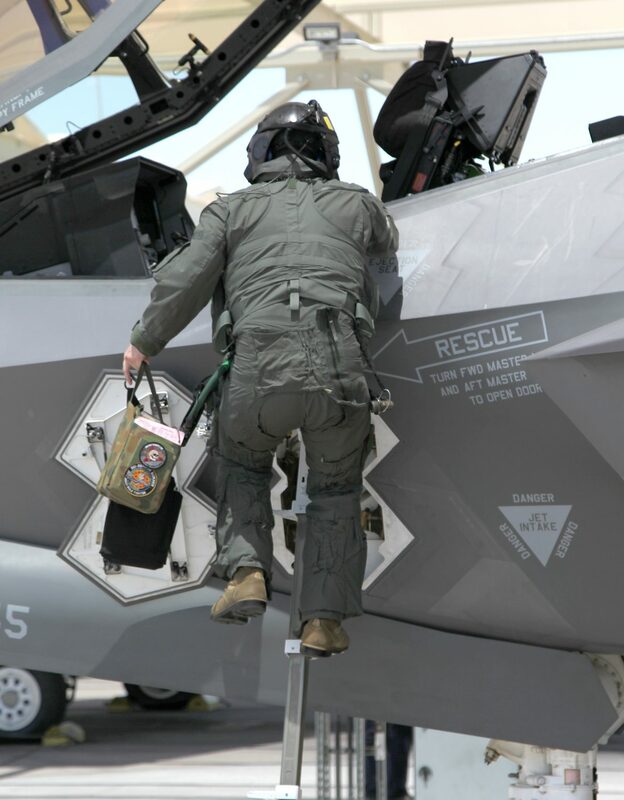 Because the F-35’s G-suit, jacket, helmet and other ancillary clothing and life-support equipment are all unique to the jet, an IP is assigned to help the trainee pilot suit up and strap into the jet for their first flight. LtCol Heirlmeier said new F-35 pilots with previous fighter experience will go through a course of about four to five months. “They do six weeks of academics and simulator events including 12 simulators before the first sortie,” he said. “And then they’ll fly with us through the transition phases before they get some exposure to each of the mission phases. This will culminate with a check which will clear them to fly as a pilot. New USAF pilots without previous fast-jet experience complete an eight to 10 months conversion. They are then posted to an operational squadron for a tour to become combat-proficient before they can qualify to become instructor pilots. 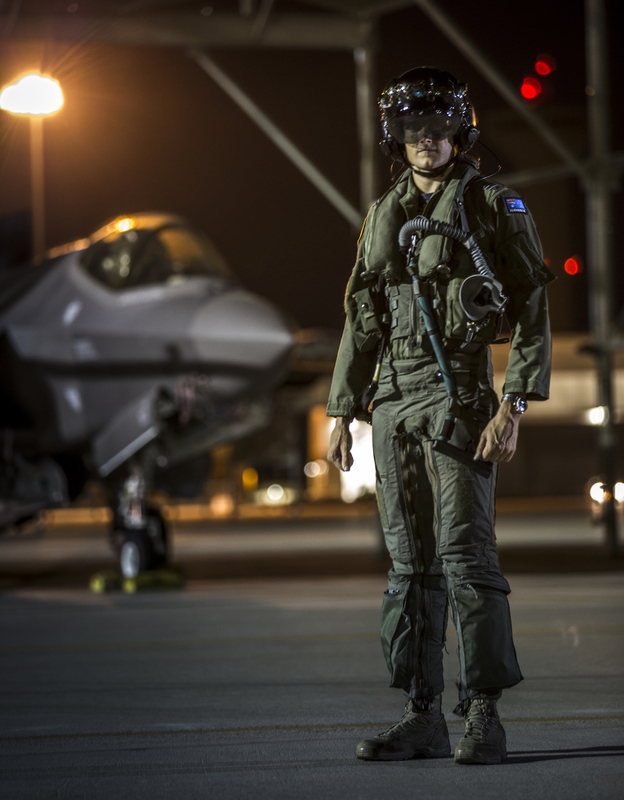 WGCDR Andrew ‘Jacko’ Jackson was the RAAF’s first F-35 pilot, and arrived at Luke via Eglin AFB in 2015. He explained some of the key handling differences between the F-35 and the Hornet it is replacing. “Some of the handling qualities would be more Super Hornet than Hornet, so from that perspective it’s very comfortable to transition to, and it feels similar. “Where it is different, obviously, is the low-observable piece of the puzzle,” he added. “And then the sensors that go along with that and the way that the system ties all that together through fusion – I think in that regard the way you operate the F-35 tactically and how you deal with particular tactical problems is obviously quite different. 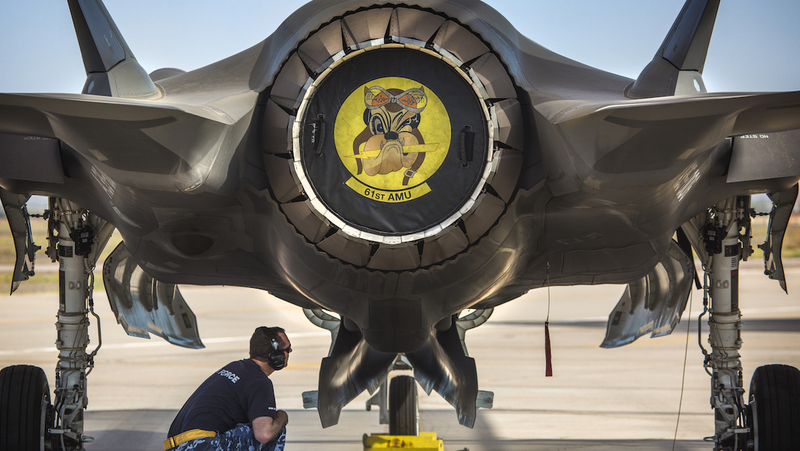 The F-35’s sophisticated mission planning capability combines the various environmental and mission-specific data such as weapons, radars, other aircraft and EW systems, all integrated with the F-35’s suite of advanced sensors to generate superior situational awareness. The F-35 mission data files are scenario-specific data systems which integrate various sources of information about geography, airspace, and potential threats with IMD enabling the characterisation of the all-important threat environment to ensure information advantage over an adversary. WGCDR Jackson said the way the RAAF builds its mission data file in the future will be critical to how successful it will be in a contingency operation. “Getting that stuff right is critical and then that obviously shapes how you interact with the environment,” he said. While the RAAF has been ramping up its training workforce at Luke, developing the IMD hasn’t been a primary focus. “While our first mission data products have been cut, until we start operating over the far side of the ramp, we’re not going to see what’s really going on there,” WGCDR Jackson said. “Obviously, Australia is one of the countries that’s invested in the ACURL (the Australia-Canada-United Kingdom Reprogramming Laboratory). 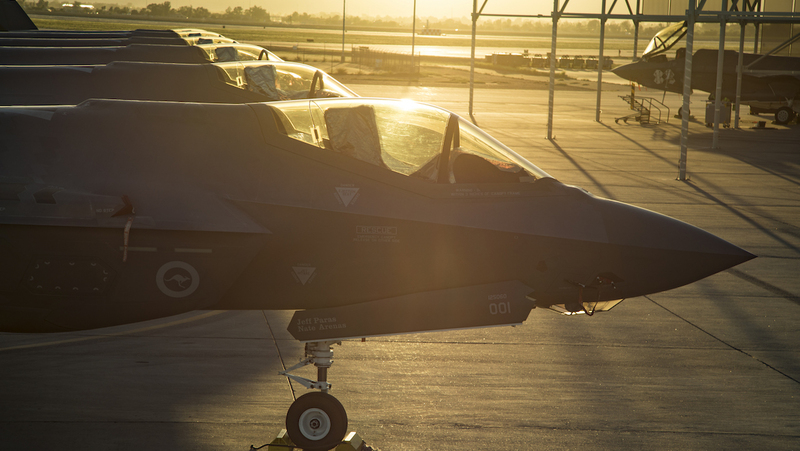 The two-year V&V will be the major effort in order to achieve an initial operational capability (IOC), and will validate the F-35’s capabilities in an Australian operational and maintenance environment. WGCDR Jackson said the other key difference between the F-35 and older generation jets is the built-in mission flexibility the new jet brings to the fight. “I think one of the other differences with flying the F-35 is it’s pretty much always a clean jet,” he said. “The performance is considerably better than an aircraft that’s lugging around a bunch of tanks or external weapons. “We commonly equate some of the performance to a classic Hornet carrying a centreline tank, but even that’s probably not valid. The F-35’s sea level performance in mil power is significantly better than you would see in a classic, and as you get higher up even into the ‘40s’, if you keep the speed on the jet it goes quite well up there compared to a Hornet or Super Hornet. “But importantly, in terms of the missions that you’re flying you’ve got far more flexibility, because you’re always in a configuration that can do any of the roles. It’s not like I can’t do BFM (basic fighter manoeuvrings) that day because my fleet is ‘jugged up’ with (external) tanks, so quite often here we’ll do some BFM on the back end of the mission, whereas historically we wouldn’t have been able to do that. “Or now we can swing-role into something else, whereas maybe we wouldn’t have had that flexibility in the past because we didn’t have a targeting pod on the jet,” he said. “That creates some scheduling and training flexibility that we didn’t previously have, and it means we’re unencumbered by some of the constraints we have on the classic Hornet. “So, by nature the way we operate tactically, I can do a lot more mission elements in a single F-35 flight than I could previously, and I can stay competent across a broader range of roles using fewer focused sorties. “But in summary, with respect to the F-35’s differences to Hornet or Super Hornet, I think we’re only just starting to scratch the surface,” WGCDR Jackson said. “The nature of the way that the system interacts with the running Air Force and ADF system is very different in terms of the support we require from our range infrastructure and our intelligence back end. There’s a whole different psychology to operating the platform that we are only starting to kind of understand. SQNLDR Christopher Myles is the Participant Maintenance Liaison (PML) for Australia at Luke AFB, the primary maintenance liaison between the RAAF and the Lockheed Martin/USAF structure under which the aircraft allocated to the 61st FS operate. “I was on the backend of the HUG (Hornet upgrade program) process for the structural upgrades, and then took that project piece and put it into the sustainment system,” he said. “From there I went to 78 Wing to look after the Hawks and to oversee the transition from the RAAF maintenance to BAE Systems. “After that, someone said, ‘you sound like the right man for the job to go to Luke’. “Each partner country has a PML working with Lockheed Martin who provides all of our maintenance on this side of the base. “I guess I provide an Australian lens over how they do their maintenance,” he said. “They do it in accordance with the consolidated ground operations plan contract, but basically it looks a lot like the USAF maintenance system. 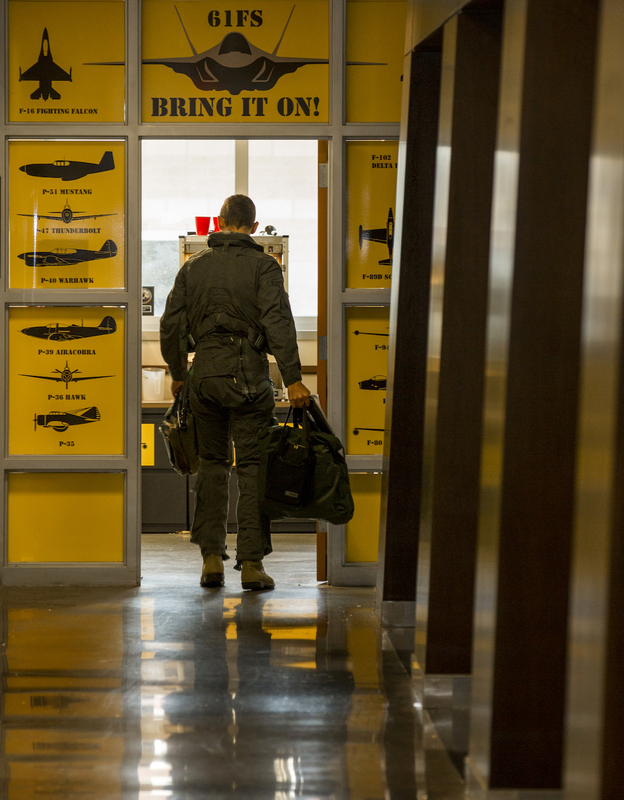 The way that the USAF think about maintenance is a bit different to us, but it makes sense – they’re a great big organisation with multiple layers of command structure, not to mention however many thousands of aircraft they have. Myles’ predecessor was SQNLDR Nathan ‘Bullet’ Draper who was recently recognised by the US government when he was awarded a Meritorious Service Medal for his significant contribution to the establishment of the Australian training, maintenance and engineering effort at Luke. Draper served as the Australian PML lead at Luke from 2014 until 2017, and played a significant role in establishing the initial RAAF and other partner nations F-35 complements, including those from Norway and Italy. “Bullet got here about mid-2014 to receive Aussie one and two (AU-1 and AU-2) in December that year,” said Myles. The RAAF’s maintenance personnel at Luke are there under what’s called a pooling implementation arrangement across the 61st FS. They are all experienced technicians, most of whom have come from fast jets and, while a few of the RAAF maintainers at Luke will become trainers at the 2OCU ITC schoolhouse at Williamtown, the majority will form the core of 3SQN’s maintenance cadre as that unit ramps up operations in 2019 and 2020. “It’s an OJT (on the job training) set-up, and we’ve got about 25 maintainers here,” Myles said. “The average experience is about 15 years on a given type, so we’ve got a good core of experience here, and they’ve been here for 12 to 18 months now. 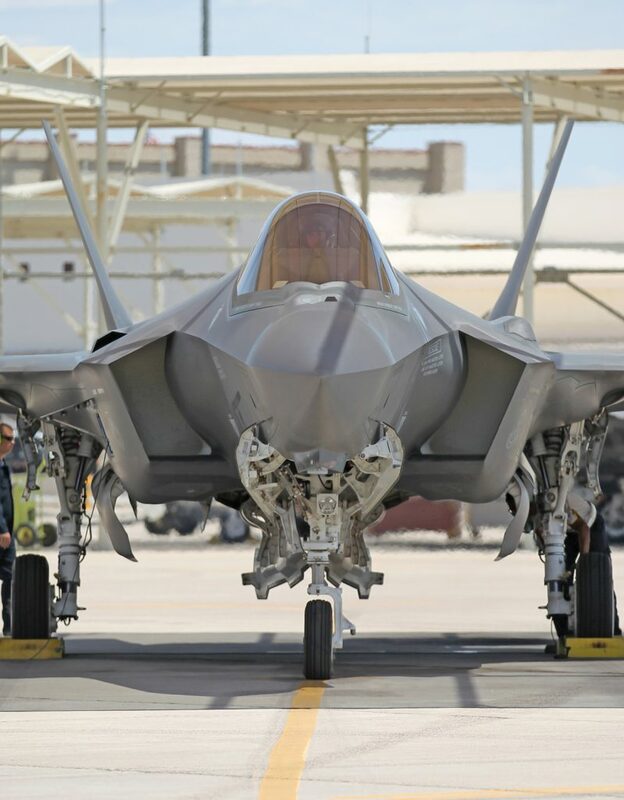 Maintenance on the F-35 is conducted using Lockheed Martin’s Autonomic Logistics Information System, or ALIS, which provides all of the aircraft’s technical publications and joint technical data in a digital format, and allows data to be centralised for maintenance and fleet management. The ALIS system at the 61st FS is a Lockheed Martin system, whereas 3SQN is now using an RAAF system. “Our maintainers really hit the ground running when they got here from the schoolhouse,” Myles explained. “They were into Lockheed with a whole bunch of really smart questions which was good. Lockheed understood the standard that our folks were at because of the groundwork laid by Bullet, so we’re able to get a bit more hands-on than otherwise might have happened. 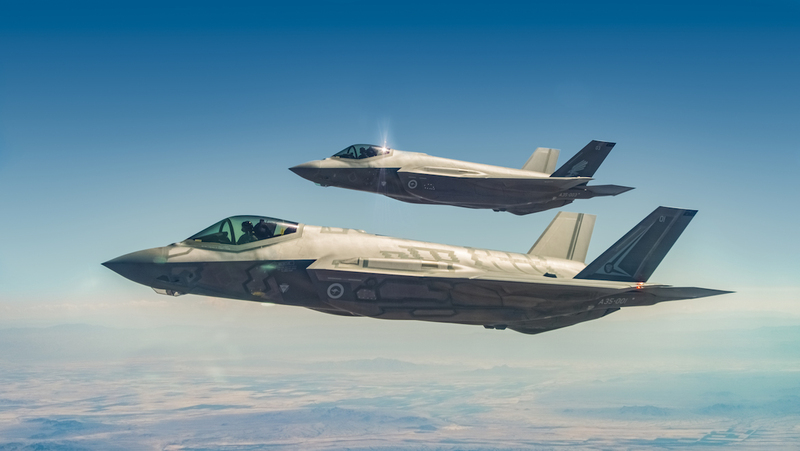 Ten RAAF F-35As will continue to be based with the 61st FS at Luke until late 2020 or early 2021. With aircraft 009 and 010, which were delivered in August and September, ferrying home in early December, aircraft 011 and 012 will then be delivered to Luke to make up the 10 aircraft commitment to the 61st FS, while all subsequent deliveries will be to 3SQN and then subsequent squadrons in Australia. VIDEO: A look at the RAAF F-35s in action from the RAAF’s YouTube channel. This story first appeared in the January/February 2019 edition of Australian Aviation magazine. To read more stories like this, become a member here.